Peace in the Middle East has never been as far away as it seems today, and a controversial United Nations Human Rights expert blames that failure on Israel. 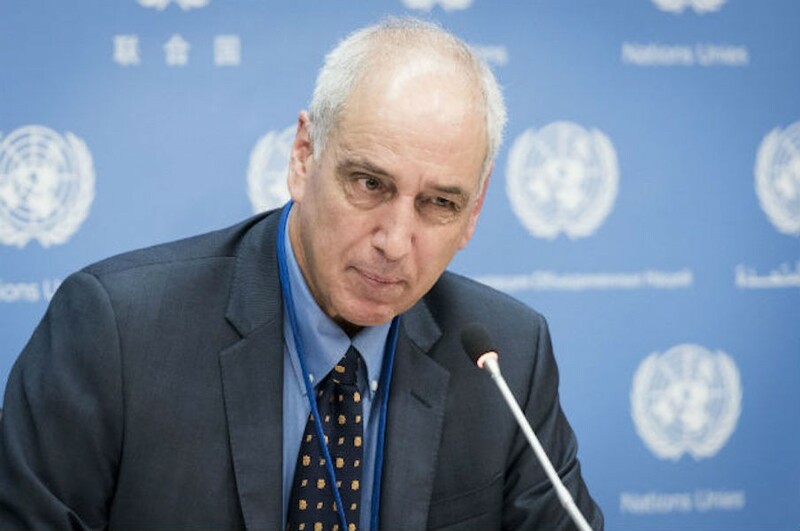 Michael Lynk, the world body’s special rapporteur on human rights in the “occupied Palestinian territories,” told a pair of Hamilton audiences recently Israel is following a well-developed plan to illegally annex the West Bank. A critical part of that plan, he added, is a concerted effort to keep Palestinians from building their own stable society. Lynk, a professor at Western University’s law school, accused Israel of violating several basic principles of international law as part of its long effort to seize the West Bank, land it illegally occupied in 1967. Israel’s alleged crimes include breaching “express prohibitions” against annexing occupied land, failing to govern occupied territory in good faith, allowing its citizens to settle on that territory and imposing collective punishments on an entire population for the crimes of a few. “International law is clear, you cannot annex a single square inch of occupied territory,” he said. A key part of the Israeli occupation plan, Lynk said, is the effort to flood the West Bank area with illegal settlers and preventing the area, and the Gaza Strip, from developing their own sustainable economies. Lynk alleged the West Bank settlements and security barrier separating Israel from that area, serve to break the Palestinian zone into a series of small, isolated communities where residents cannot move from one area to another without passing through a series of restrictive Israeli checkpoints. The result, he said, is that Palestinian towns and villages have become “destitute slums that have become hotbeds of crime” where a lack of freedom of movement stifles economic activity and growth. The economic assault, he added, has fallen especially heavily on Gaza, where Israeli land, sea and air barriers hold the population as virtual prisoners in a zone where unemployment runs 40 per cent among the general population and as much as 70 per cent among people under age 30. In addition, where United Nations studies have concluded the average gross domestic product in Israel is as high as $40,000 US per person, it is only $1,000 US in Gaza. That leaves up to 80 per cent of the population to subsist on some form of international welfare – money that has been sharply reduced in recent years. Lynk, who is to issue a new report to the UN General Assembly in October dealing with third party responsibility in the region, told his audiences international pressure will be a critical factor in ending the occupation by making it too costly for Israel to continue. Lynk’s appearances at McMaster University and Barton-Stone United Church were sponsored by a Who’s Who of anti-Israel organizations. Since his appointment in 2016 he has filed six reports with the UN – four with the Security Council and two with the General Assembly – documents that have led pro-Israel leaders to accuse him of a bias that violates the UN’s code of conduct for special rapporteurs. Those positions were repeated ahead of his Hamilton lectures. “His proximity to such actors raises reasonable questions about whether or not he is in violation of the code of conduct for special mandate holders,” Sampson wrote. In addition to McMaster University’s political science department, Lynk’s appearance is being sponsored by the local chapter of Canadians for Justice and Peace in the Middle East, the Palestinian Association of Hamilton, the McMaster Student Union club Solidarity for Palestinian Human Rights, the Social Justice Committee of the Hamilton Presbytery of the United Church of Canada, the Hamilton Coalition to Stop the War, the Jewish Liberation Theology Institute, McMaster Muslims for Peace and Justice, Democracy Probe International and Independent Jewish Voices. Conservative MP David Sweet, vice-chair of the federal Canada-Israel Interparliamentary Group, said Lynk’s history of anti-Israel bias has been well established over the years. “Back in 2016 when he was initially appointed organizations like UN Watch, CIJA and Honest Reporting strongly denounced his appointment because of what they considered his bias against Israel,” he said. “Everything I’ve seen so far has proved their point.